Senior Vice President of the Rock Steady Crew, Fabel is a renowned hip hop dancer, choreographer and historian as well as graffiti writer known as Paser. Other names used were Pas, PS Per, Perl and Cave. Respected activist and spokesman within hip hop culture, Fabel is an auspicious talent whose work includes film ( Beat Street, from Mambo to Hip Hop and more), Stage , Aerosol Art, DJing and Digital Arts. He’s an originator and inspiring voice within the genre having worked with luminaries such as the Magnificent Force and Electric Boogaloos amongst others. Jorge “Popmaster Fabel” Pabon was born and raised in Spanish Harlem, NYC where, at an early age, he developed his dance and choreography career at hip hop jams and clubs throughout the city. His pioneering individuality has been showcased internationally since 1982. President of the Hierophysics crew, Senior Vice President of the Rock Steady Crew, member of Magnificent force, and an honorary member of the Electric Boogaloos, Fabel is also co-founder of Ghettoriginal Productions, Inc. With Ghettoriginal, Fabel co-authored, co-directed, and co-choreographed the first two hip hop musicals ever, “So! What Happens Now?” And “Jam on the Groove” (first official off-broadway hip hop musical). He has also toured internationally as a featured performer with “Jam on the Groove,” which was nominated for best choreography at the drama desk awards in 1996. Fabel was also featured in the cult classic hip hop movie “Beat Street.” Along with fellow members of the Rhythm Technicians and Rock Steady Crew, he won the 1991 Bessie award for choreography. Highlights of his career include performing in Lincoln Center’s “Serious Fun!”; PBS.’s “Great Performances 20th Anniversary Special”; the Boston Ballet; the 1994 American-Japan Festival (sponsored by the Smithsonian Institution); both the 1983 and 1991 Kennedy Center Honors Gala events, and a hip hop version of Kurt Weill’s “September Songs” for PBS Fabel was the first american hip hop dancer to perform in Cuba, in 1986 & 1988, with the dance company, Ballet D’Angelo. In 1999, Fabel served as a consultant, moderator, panelist, and writer for the Rock and Roll Hall of Fame and museum’s exhibit and conference: “The Hip Hop Nation: Roots, Rhyme and Rage.” When this exhibit traveled to the Brooklyn Museum of Art in September, 2000, Fabel was invited to lecture and serve on the exhibit’s honorary committee. A vintage hip hop outfit, owned by Fabel is presently on display at the Experience Music Project in Seattle, WA. Visitors to EMP are guided through the hip hop clothing exhibit with Fabel’s voice detailing every aspect of the outfits displayed. He is the first hip hop dance instructor to be employed at NYU’s Experimental Dance Theater wing. Fabel gives lectures, demonstrations, master classes, and participates in outreach programs and conferences internationally. In 2001, he addressed delegates at the United Nation’s “Hip Hop Conference for Peace.” Fabel regularly teaches dance in various Schools for the Sports and arts in School’s Foundation. Fabel has also been commissioned to teach dance workshops at such institutions as the Dalton School and Central Park East One, among the many. He is currently working on three documentaries: “Apache Line”, “Fabel’s History of Hip Hop Fashion vol. 1″ and “Puerto Ricans in Hip Hop.” Fabel is a historian of and activist within hip hop culture. His other forms of expression include “Graffiti” art, DJ’ing and rhyming. Fabel is a co-founder of Tools of War, a grass roots hip hop company covering publicity, events coordination and promotions, activism, bookings, and consultation. 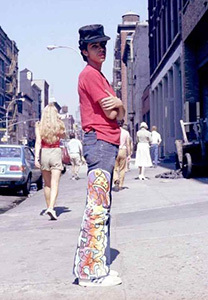 Fabel’s essays are featured in: Joe Conzo’s ,”Born in the Bronx”, Martha Cooper’s ” Hip Hop Files”, ” the Nasty Terrible T-Kid170″ as well as “Total Chaos” edited by Jeff Chang. He offers lectures, demonstrations, master classes, and participates in outreach programs and conferences internationally. He is a historian of and activist within the hip hop culture. As a witness to the growth of the culture since 1976, Fabel believes that true hip hop culture is a blessing from the creator given to uplift and unify youth globally.